Bryan says Miz and Maryse came to the ring and mocked his retirement. Miz came out here and acted like he didn’t cheat at SummerSlam. Just like with everything else, Miz is a terrible actor. Miz couldn’t even act like a tough guy. Miz pulled his wife in front of him like a shield. Then Brie came to the ring and took care of business. Brie says it felt so good to come to the ring and punch Miz in the face. 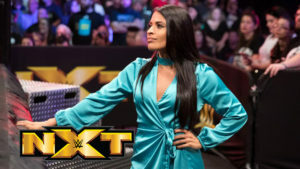 Andrade “Cien” Alams and Zelina Vega interrupt. Vega gets in the ring and says it’s an honor to stand in the ring with two legends: Brie Bella and Andrade Almas. Vega challenges Bryan to a match. Bryan says he would love to make the match official right now but he isn’t the GM anymore. If only there was someone in the back who could come out and make this match. Paige doesn’t show. Bryan says that was embarrassing. Paige runs out on the stage. Paige said she had to run from one side of the building to the other. Paige books the match. Almas goes tranquillo. Bryan dropkicks Almas off the ropes. As Bryan is getting into the ring Almas pounced on Bryan. Almas hits Ax and Smash on Bryan. Bryan kicks out. Almas puts Bryan in a reverse Gory Special. Bryan powers out and rolls up Almas. Almas kicks out and chops the heck out of Bryan. Bryan and Almas trade chops. Bryan kicks Almas in the corner. Running dropkicks by Bryan. Bryan tries another but Almas trails him and lands a knee to Bryan’s face. Almas tries another but Bryan moves out of the way. Almas is sent flying to the outside. Bryan lands a flying knee off the apron. Back in the ring, Almas destroys Bryan with a spinning back elbow. After the break, Almas has Bryan in a rope hang arm breaker. Almas releases the hold. Alams goes up top. Bryan dropkicks Almas to crotch him on the top rope. Bryan butterfly suplexes Almas off the top. Miz comes down to the ring. Bryan suicide dives onto Miz. Almas does a springboard corkscrew splash to the outside onto Bryan. Almas crushes Bryan with a tornado reverse DDT. Bryan kicks out. Almas tries a moonsault. Bryan gets a boot up. Bryan puts Almas in the Yes! Lock. Vega gets on the apron. Brie attacks Vega. Maryse appears behind Brie. Maryse sends Brie into the ring post. Miz attacks Bryan from behind to cause a disqualification. After the match, Almas Hammerlock DDTs Bryan. Maryse holds Brie in the corner as Vega hits Meteora. Mayrse DDTs Brie as Miz has Bryan in the crossface. Miz drops Bryan with the Skull Crushing Finale.